Allergy Eye Relief is specifically formulated to relieve the symptoms associated with allergies such as: burning, itching, redness of eyes and lids, and excessive watering of the eyes. 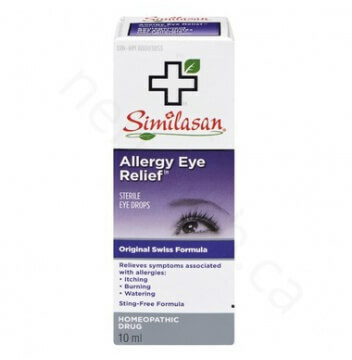 We all want our eyes to feel better during allergy season, but many allergy sufferers are concerned about the chemicals found in allergy eye drops. Traditional over-the-counter allergy drops use chemicals such as vasoconstrictors to mask symptoms. Vasoconstrictors may actually worsen the symptoms if used more than directed (usually 4 times a day maximum). Similasan of Switzerland works differently, by using natural botanical extracts used for over 200 years to stimulate the body's natural defenses and target the root cause, so you can feel better without harsh chemicals. Adults and children (over 2): Remove tamper-evident seal from neck of bottle. Apply as needed up to 72 hours. For external use only. Initial exacerbation of symptoms may occur. Use only if bottle seal is intact. Replace cap tightly after every use. To avoid contamination, do not touch the tip of the container to any surface. Discard open bottle after 30 days. Contact wearers: consult a physician prior to using. If pregnant, consult a physician before using. Keep this and all medicines out of the reach of children. Do not use: If the solution changes color or becomes cloudy. Stop use and ask a physician if: Symptoms worsen or persist for more than 72 hours, changes in vision occur or you experience eye pain.